Concern over use of the synthetic marijuana sold as “Spice” and under other names has prompted the Navy and Air Force to ban the legal drug, with the Army and Marine Corps taking steps in that direction. The catch is that it doesn’t show up in drug tests, so the services are in a bind when it comes to enforcing the ban. Navy Times wants to hear from sailors who are current or former users, or if you’ve known sailors or others who have used Spice. Do you or your friends use it? 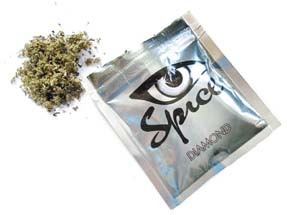 How prevalent is Spice use in your unit? Do you think it’s dangerous? Is it readily available where you’re stationed, or do you buy it online? How often do you use it? Do you think it should have been banned? How can the services enforce the ban? Your comments could appear in an upcoming story, but your name will not be disclosed without your permission. Send comments to Hampton Roads Bureau Chief Bill McMichael at bmcmichael@militarytimes.com. Great. They’ve already had a bunch of ships over the past few years run aground and now I guess they want to totally cripple all our navigators. @Spade – your comment is amusing to Dune (Frank Herbert’s novel) fans, but I wonder if it’s tongue-in-cheek? Or does this explain the spate of CO SSN “Oh Navigator, Holy Loch and I await thee” jokes from the 60s?